The Alfa Romeo team have fitted their C38 with a set of additional fins on the upper edges of the monocoque. 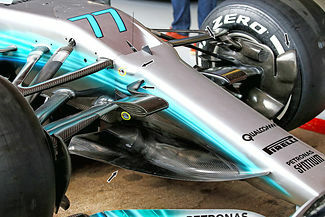 Attached to the panel that covers the upper front suspension elements, there are 4 vertical fins on the left and right sides of the S-duct exit. 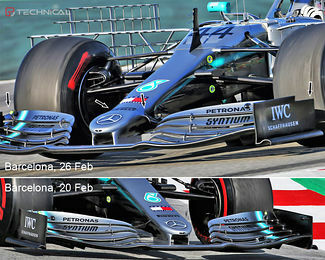 Just like the fins that Mercedes added, they direct airflow outboard, helping extraction of air out of the S-duct. 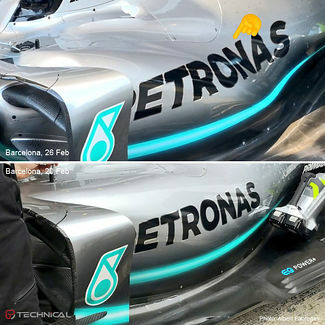 Mercedes have drawn most of the attention to them at today's testing, thanks to having an upgrade package "that leaves not a single aerodynamic element unchanged". Indeed, the updates are extensive, and reaching a lot further than the nose and front wing changes we mentioned earlier on. Mercedes have kicked off the second week of testing at Circuit de Catalunya, Barcelona by adding a new front end to their W10. 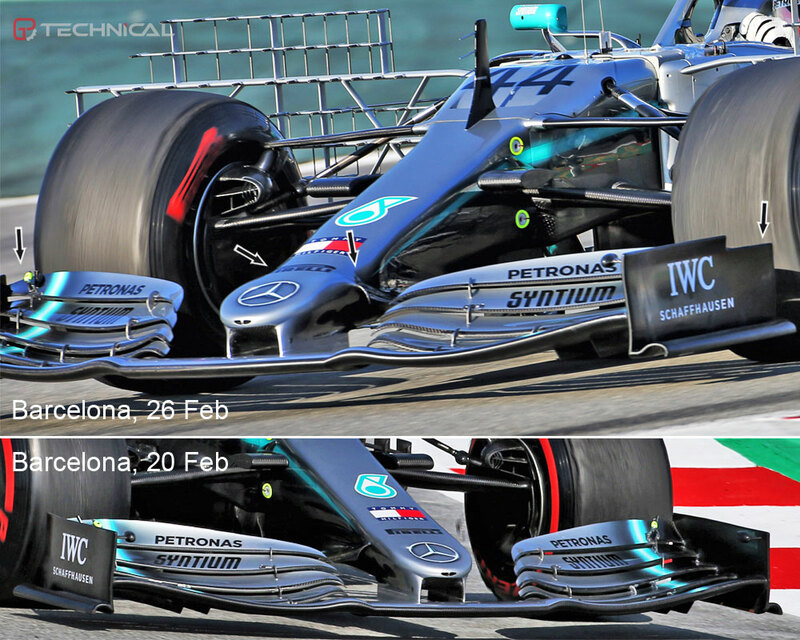 Having struggled with front end grip during the first 4 days of testing, the upgrades will come as a welcome addition to Lewis Hamilton and Valtteri Bottas. Testing usually sees teams apply flowviz paint on their cars to visualize airflow on certain car elements. They do so to verify the findings from the windtunnel and detect any unwanted effect that was not simulated. 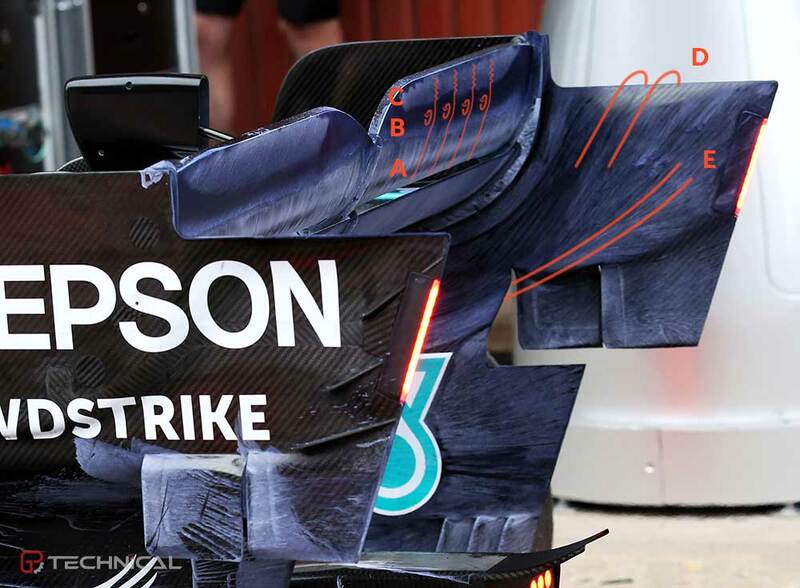 So did Mercedes, revealing airflow on the suction surface of the rear wing and its endplates (flows D and E). 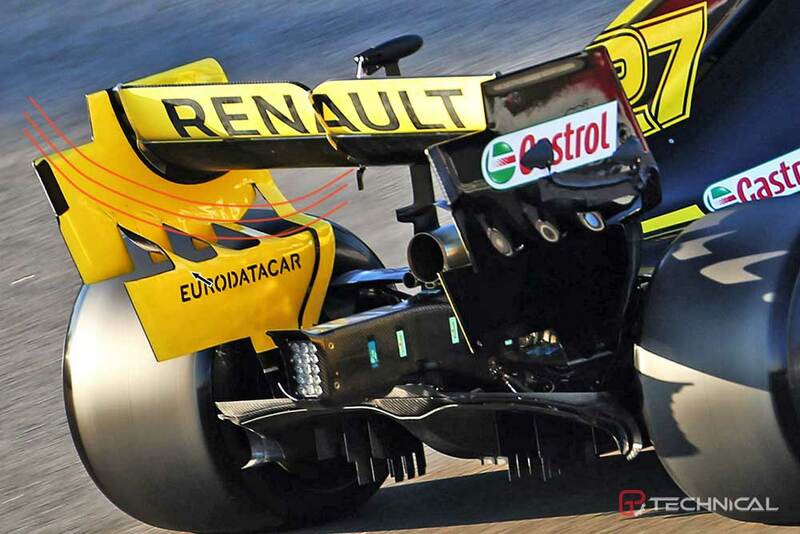 Renault F1 have arrived at Barcelona with an interesting update on their car, one that was photoshopped away from its launch renderings. It may appear like a no-brainer, but Renault has become the first team to generate proper downforce through vanes on the rear wing endplates. 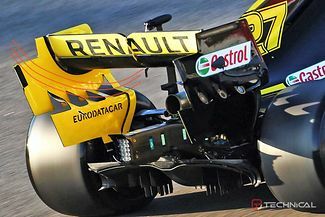 While other teams limit themselves to vertical vanes that help clean up the flow or inject some more airflow underneath the rear wing, Renault have taken a different approach. 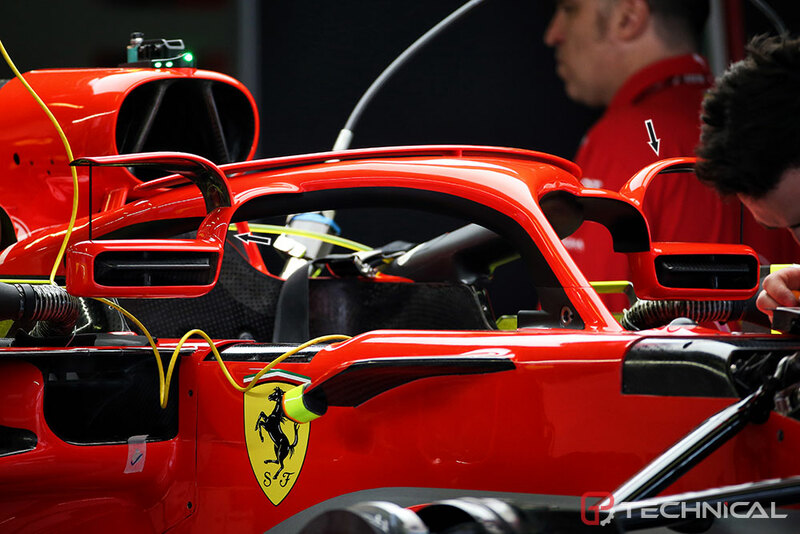 Ferrari showed up at Barcelona with new wing mirror supports. Instead of the attachment to the chassis shoulders, the wing mirrors are linked to the halo. 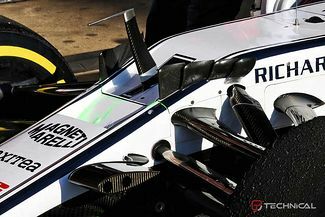 The team have meanwhile also added a winglet just above the mirror housing, perfectly shading the mirror itself when looking at the car from above. 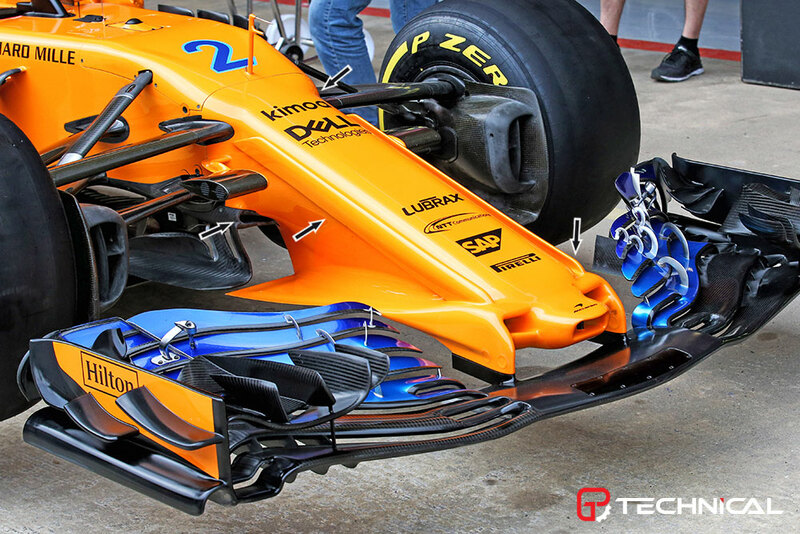 McLaren didn't disappoint with their much anticipated aerodynamic update to the Renault-powered MCL33. With updates all around the car, the most intriguing changes were done at the front, where an entirely new and unique nose cone has debuted on the car when it was sent to scrutineering on Thursday afternoon. A lot has been said about Ferrari's innovative wing mirrors. Changes like this are hard to come by these days in Formula One, but Ferrari have certainly thought out of the box here. 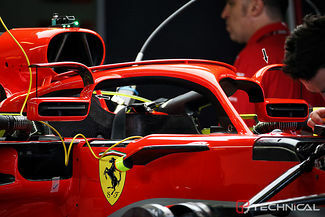 While all other teams have their mirror housings as round as possible, to limit drag created by them, Ferrari's items feature a small gap all around the actual mirror. 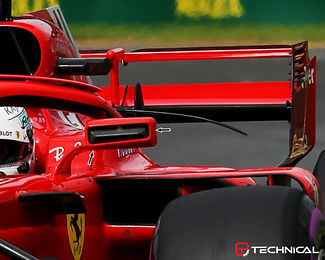 The traditional mirrors guide all air around the housing, whereas with Ferrari's new design, some airflow flows through the housing. 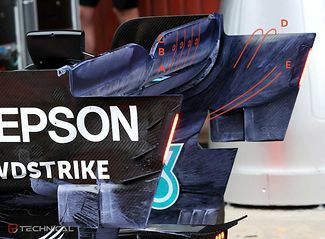 In what continues to be a crucial area of aerodynamic development, Red Bull Racing turned up in Australia with an improved version of their barge board panels, which make up for a quite complicated set-up, even this early in the season. 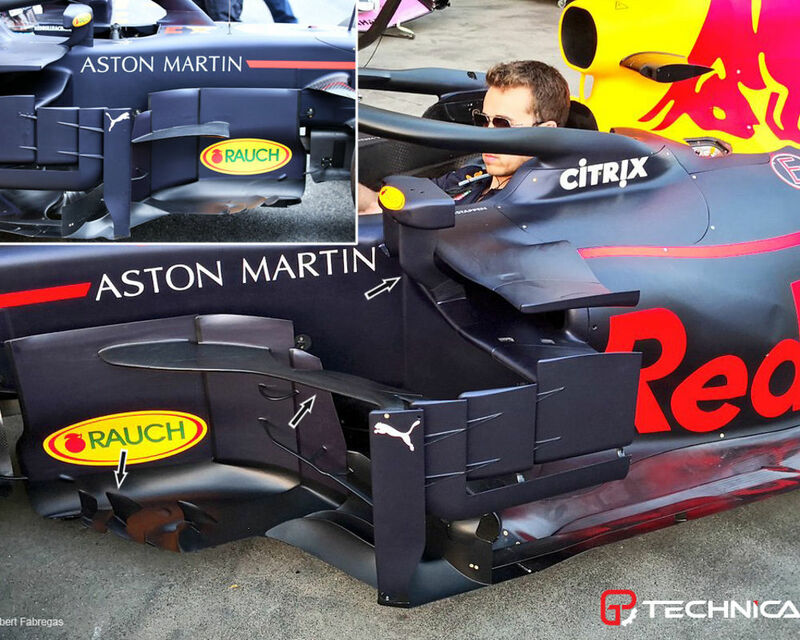 Thanks to the stable regulations, teams are happily continuing the development paths of last year, even though further downstream, Red Bull's high sidepod inlets are a big change compared to their 2017 RB13. The Spanish GP is usually the venue of the introduction of the first significant development packages of a season. This year, Red Bull was expected to launch a heavily upgraded car after its woeful start to this year’s campaign. The energy drink-owned team brought some aerodynamic changes to its challenger, but it was Mercedes that drew most of the attention to itself by a major front end aerodynamic update.